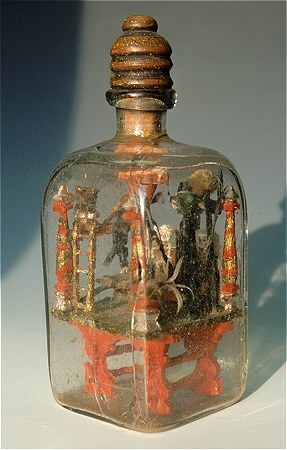 Building objects and scenes in bottles dates to the late 1600’s. The first known reference is from a verse written in 1679 and the first known bottles that still exist are those built by Matthias Buchinger and JC Hero (also seen as JC Held) in 1719. 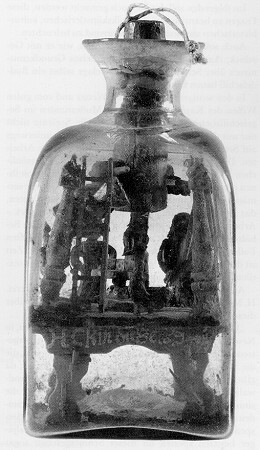 Mining scenes, people, equipment, and tools were among the first objects and scenes built in bottles. 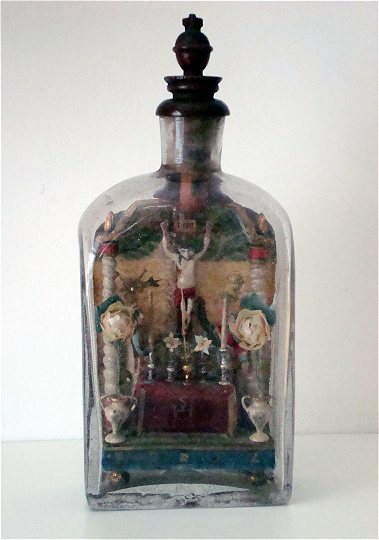 Many religious bottles were made to sell to travelers who made pilgrimages to the Holy Lands and other religious shrines. It is likely that monks and other religious would make these to provide funding for their monasteries. There are many dated bottles from the 1920 – 30’s that are likely examples of these bottles. Each share common characteristics in the style and contents and each have a similar date in the bottom front of the bottle. In the 1950’s several bottles of similar style were made for sale to the pilgrims in Jerusalem. 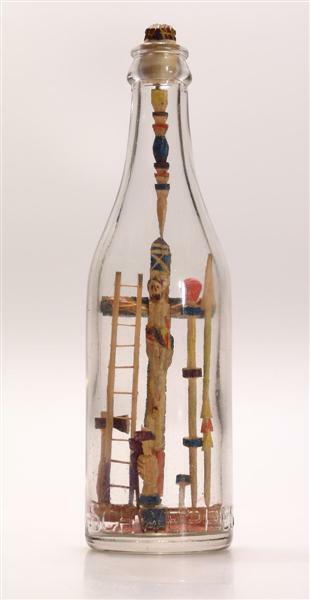 While it is not uncommon to find ships in bottles, particularly warships from the WW II era made by POW’s from camps in England and Canada, only one artist has been identified as a POW who made a religious bottle. He was an Italian captured in South Africa and later detained at Eden Camp in Britain. The first inmates of Eden Camp were approximately 250 Italian prisoners and Augusto Vignali was believed to have been one of them. He is known to have made two bottles, both religious scenes. 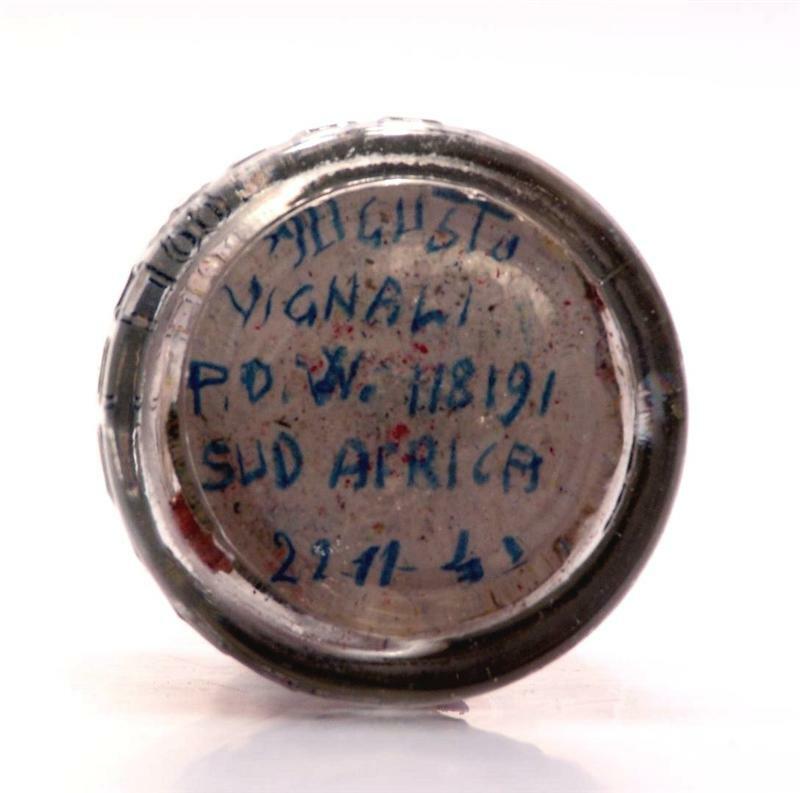 One of the bottles, signed and dated by the artist, has the following on the inside bottom “Augusto Vignali P.O.W.118191 Sud Africa 22-11-41.” His other bottle states: “"Remember P.O.W. Itali Name Vignali Augusto Italia Selbi 19-10-43." His bottles are brightly colored and his carvings are relatively primitive but remarkable considering the circumstances under which they were carved. 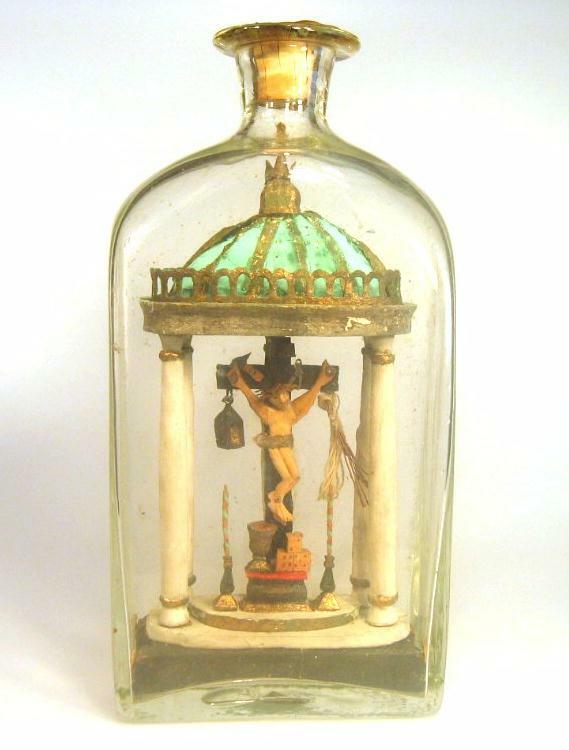 The skill of the makers of religious bottles varied a great deal, as well as what they chose to include in their bottles and the methods and materials used. 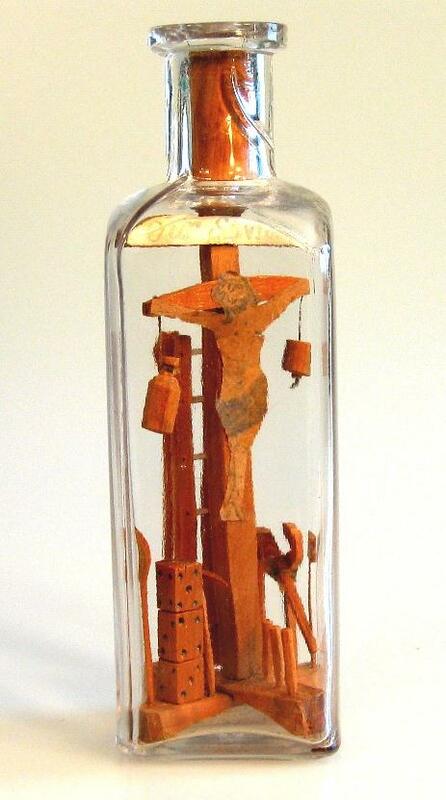 Some bottles contain only a simple wooden cross mounted on a wooden base inside the bottle. Many bottles have a single cross or sometimes the three crosses of Jesus and the two thieves. There are bottles with actual wooden carvings and some with figures from old nativity sets. Among the figures you will find are Jesus on the cross, Roman guards or centurions, the two thieves, an angel, Mary Magdalene, Joseph, and others. More commonly, you find bottles with the wooden cross and symbols without a figure represented, or figures and symbols cut out from early Holy Cards and glued on the cross or against the base. 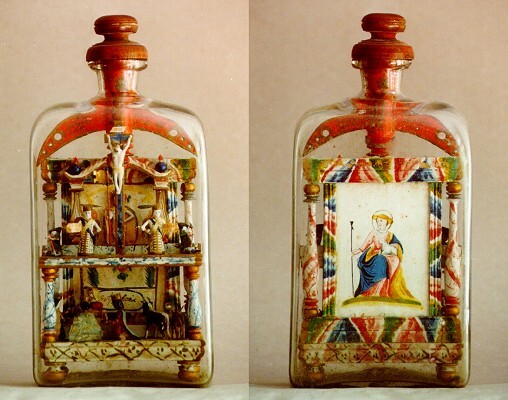 Religious scenes in bottles are more than just wonderful examples of folk art which display the skill and creativity of the builder. They are bottles made by deeply religious individuals whose fervor and passion are seen and felt in the carvings and symbols represented. They can also serve as a memorial, or a tribute to a loved one or perhaps a lost soldier or sailor.